Satay or sate is a dish of marinated, skewered and grilled meats, served with a sauce. Satay may consist of diced or sliced chicken, goat, mutton, beef, pork, fish, tofu, cockle or other meats. The more authentic version uses skewers from the midrib of the coconut palm frond, although bamboo skewers are often used. These are grilled or barbecued over a wood or charcoal fire, then served with various spicy seasonings. Satay is available almost anywhere in Malaysia, where it has become a national dish. It is also popular in many other Southeast Asian countries such as Indonesia, Singapore, Brunei, Thailand, the southern Philippines. In Melaka, satay is a popular dish especially during celebrations and can be found throughout the country. Close analogues are yakitori from Japan, shish kebab from Turkey, chuanr from China and sosatie from South Africa. Turmeric is a compulsory ingredient used to marinate satay, which gives the dish its characteristic yellow colour. Meats commonly used include beef, mutton, venison, fish, shrimp, squid, chicken, rabbit and even tripe. Satay may be served with a spicy peanut sauce dip, or peanut gravy, slivers of onions and cucumbers, and ketupat (rice cakes). A variation of the meat satay is the satay lok-lok from Penang and satay celup (dip satay) from Melaka. Both are Malaysian Chinese twists of the hotpot and the Malay satay. Raw meat pieces, tofu pieces, century eggs, quail eggs, fish cake pieces, offal or vegetable pieces are skewered on bamboo sticks. These are cooked by being dipped in boiling water or stock. The satay is eaten with a blackish sweet sauce with or without chili sauce. If the satay is eaten with satay sauce, it is called satay lok-lok. If the satay is cooked with boiling satay peanut sauce, it is called satay celup. This is available either from street vendors or at certain restaurants. Most of them are non-halal. 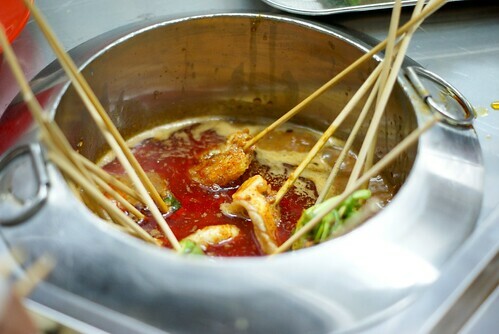 Customers use a common container containing boiling stock to personally cook their satay. Sauces are either served in common containers or individually. There are no tables when you eat at street vendors and thus customers enjoy the food standing around the food cart. Melakan love to eat satay in the morning and afternoon as their breakfast or lunch. You can find several restaurants in Melaka serve satay at night. The most popular satay restaurants is located in Kampung Jawa.